If the indicator comes on at any other time, or does not come on at all, have the system checked by a dealer as soon as possible. 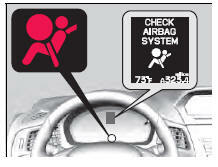 If you don't, your airbags and seat belt tensioners may not work properly when they are needed. Ignoring the SRS indicator can result in serious injury or death if the airbag systems or tensioners do not work properly. Have your vehicle checked by a dealer as soon as possible if the SRS indicator alerts you to a possible problem.